Lloyds Meadow Fishery is located near Chester in Cheshire. 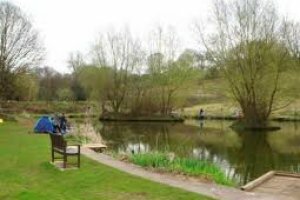 The fishery comprises four mixed coarse fishing lakes offering a variety of coarse fish including Carp, Bream, Barbel and Chub. There are several disabled friendly pegs at the fishery, night fishing is allowed but you need to bring your own food to the site as there is no cafe where one can purchase snacks or drings. Badger and Fox have only recently been put into the fishery so nobody really knows just how big the fish are. Lloyds Meadow fishery 10 out of 10 based on 1 ratings. 1 user reviews. Fished here with my son on Bank Holiday Monday, it was scorching, we fished on the first disabled peg by the path on Kingfisher plenty of room for the two of us and had a great day. The Carp were busy doing 'the what comes naturally' at this time of year so were a bit reluctant to come out to play, despite not catching loads we still managed a few decent Bream and a good sized Common. Loads of wildlife to be seen too, I shall certainly go back.